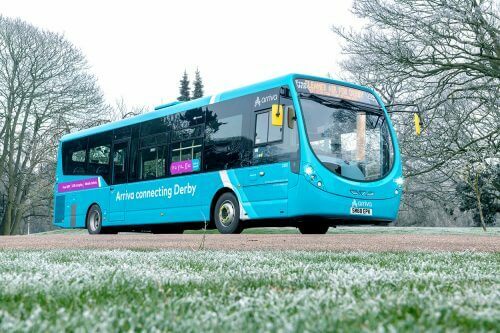 Arriva has invested £3.5m in 19 new Wrightbus StreetLite Micro Hybrid single-deckers for Derby. The new vehicles were launched by the City Council as it welcomed Chris Grayling MP, Secretary of State of Transport to the city at Derby’s Markeaton Park. The launch follows the city’s introduction of the Government’s National Air Quality Plan. Each bus comes equipped with E-Leather seats, USB charging ports and WiFi, and meets Euro VI emissions standards. Arriva intends to send the buses into operation on routes 7, serving Sinfin every 15 minutes, 5/5A running to Littleover and The Royal Derby Hospital every 20 minutes, and the 8 and 9 operating seven buses an hour via Mackworth. “To do this we need to ensure that our customers are given access to transport that meets their growing expectations in terms of technology and comfort, but that also delivers with regards to environmental standards. “These new vehicles do just that, offering high-specification interiors coupled with the very latest low-emission engines and stop-start technology.